Quotes are helpful to set the tone for your scrapbook page or project. 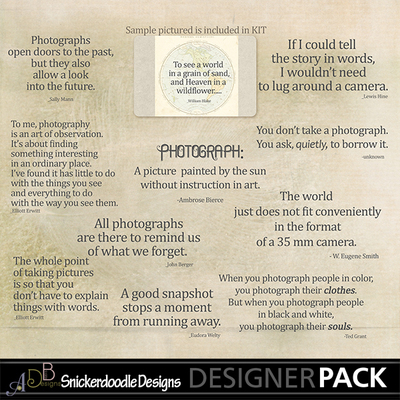 This is a set of 10 photography related quotes, perfect to help you tell your story. Combine with It’s a Snap Journal Cards for the perfect complement, or add to your scrapbook pages just as they are. It’s a Snap Inspirational Quotes are offered separately for your convenience, but are also part of the It's a Snap Collection, which is your best value.